NASA astronaut Rick Mastracchio moves toward the International Space Station's robotic arm as the station moves into daylight on Dec. 24, 2013. Two American astronauts are spending Christmas Eve working in the vacuum of space to hopefully fix the vital cooling system aboard the International Space Station. 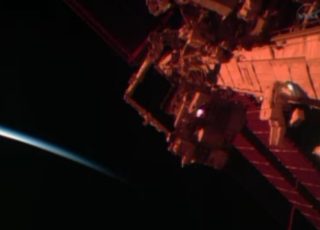 NASA astronauts Mike Hopkins and Rick Mastracchio officially started the spacewalk at 6:53 a.m. EST (1153 GMT). The two astronauts ventured outside of the space station's Quest airlock shortly afterwards, getting to work on their second spacewalk in four days. You can watch the spacewalk live on SPACE.com today (Dec. 24) via NASA TV. NASA astronaut Mike Hopkins floats outside the International Space Station on Dec. 24, 2013. During today's 6.5-hour spacewalk, Hopkins and Mastracchio will work to replace a faulty pump module that helps cool equipment inside and outside of the space laboratory. Since part of the pump failed on Dec. 11, non-critical systems and science experiments in two of the station's laboratories have been shut down. NASA officials have said the six astronauts currently living inside the space station are not in any immediate danger, but the series of spacewalks is necessary to get the orbiting outpost back to normal. On Dec. 21, Hopkins and Mastracchio performed the first urgent spacewalk in which they successfully removed the failed refrigerator-size pump module and stored it on a nearby platform ahead of schedule. During today's walk, the astronauts will install a replacement pump module stored on the station's exterior. If the astronauts' work goes as planned, NASA officials said a third spacewalk probably won't be necessary, and the two astronauts will have a quiet Christmas Day. Mastracchio is wearing a different spacesuit for Tuesday's extra-vehicular activity. Space agency officials say the issue is unrelated to the leak that flooded Italian astronaut Luca Parmitano's spacesuit during a spacewalk in July.